Well, I think that Wakasa is Asaka. The handmirror probably belonged to her. My guess is that Asaka discovered the body of Haneda, along with Rum. Asaka and Rum strugged and made a mess out of the room, but during that time Asaka got her hands on the shogi piece and escaped. Rum left too, because he fears that their fight has been heard, and he couldn't take time to clean the room. I honestly don't have any alts. At least not yet. 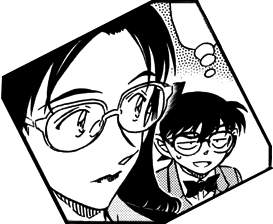 I strive to find that one answer that Gosho is foreshadowing, and unless the plot hints to otherwise, I have no reason to look for other answers, right now at least. Perhaps you have some new perspectives you would like to enlighten me with? 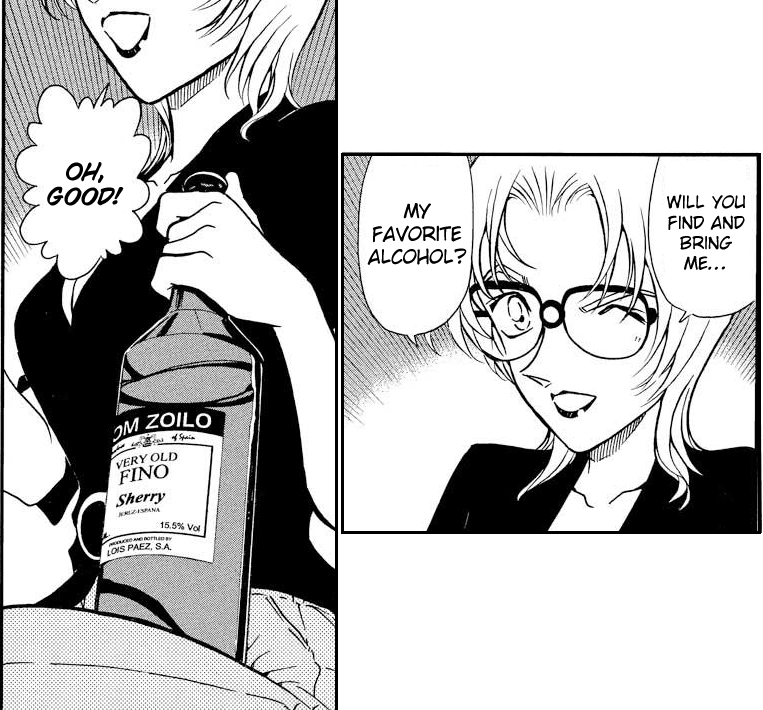 If Rumi's not Vermouth, then I see her as someone with a score to settle with Rum, and someone who had to have been at the scene (in order to take the Ryuma shogi piece—take it from Kōji's dead hand, presumably). Ergo, she must be Asaka, or a sixth party (Asaka, Amanda, Kōji, Rum, Tsutomu are the 5 I presume were at the scene on that day) on the scene whose presence we haven't yet been privy to. The next question in turn would be "what happened to Asaka that lead to their disappearance?" 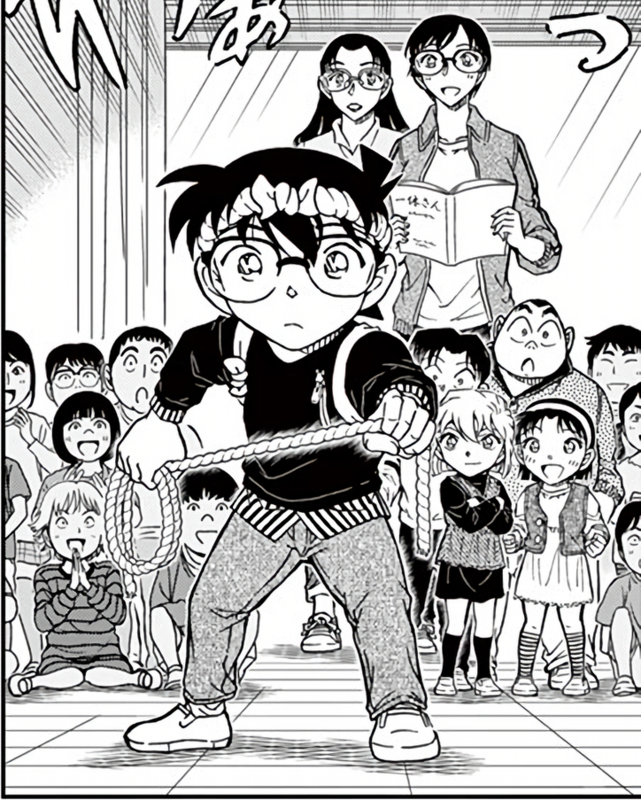 As for a the sixth party suggestion, I find it unlikely that Gosho will add new players that we haven't at least somehow been hinted to have been there (like how Tsutomu's involvement was brought up outside of the Kohji website) more than 77 chapters later since the Kohji case intro. Rum didn't force his way into Amanda's room—that would've likely led to it ending up messy. 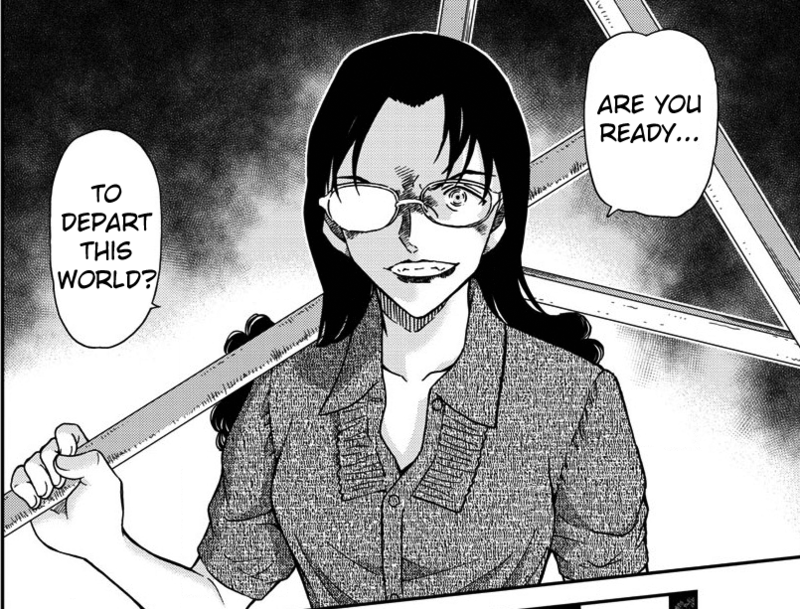 If Asaka was standing outside Amanda's room, if Rum had just began by attacking Asaka, then he'd have to deal with hiding the body—and if Amanda didn't expect him, and noticed Asaka was gone or wondered why her bodyguard let this person in, the room might've become messy as Amanda panicked and tried to defend herself. If Asaka was standing inside the room, then Amanda would've likely noticed the commotion of Rum attacking Asaka, and if their fight spilled into the room from the doorway, Amanda's room could've ended up messy, also because Amanda might've reacted in panic to Rum. 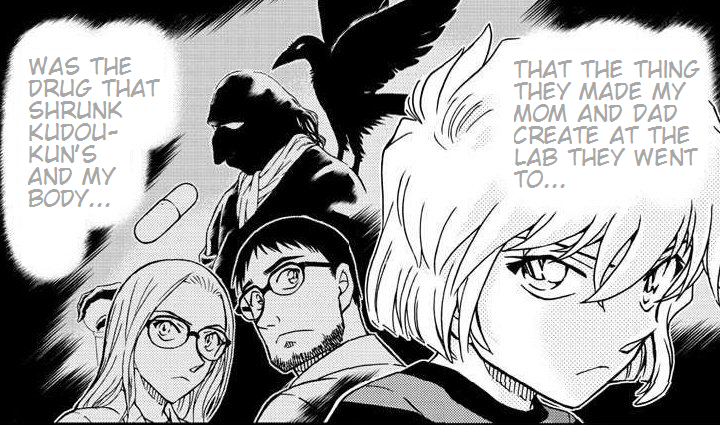 More likely, Rum was let in by Amanda and Asaka, neither of whom thought the former's life was in danger—if Rum was someone Amanda expected, why attack immediately and risk his intent being exposed immediately when he could just slip in casually and poison Amanda under Asaka's nose. 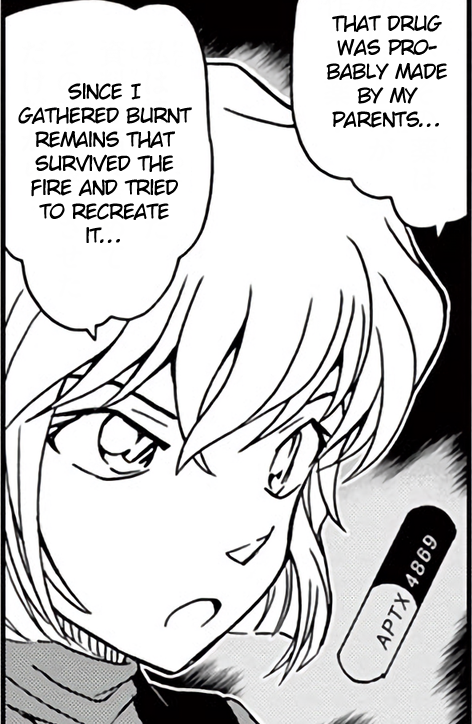 In other words, Amanda was killed first, and then Asaka was attacked. If Asaka wasn't APTX'd, then Rum must've been distracted—likely by Kōji (Asaka Vs Rum might've been underway in the hallway by the time Kōji came into view, or he came into view of the room just in time to see the fight spill out into the hallway). I presume that and Tsutomu's interference bought time for Asaka to regain consciousness—Asaka probably regained consciousness to find Kōji dead. Presuming they'd be arrested, they fled the scene. 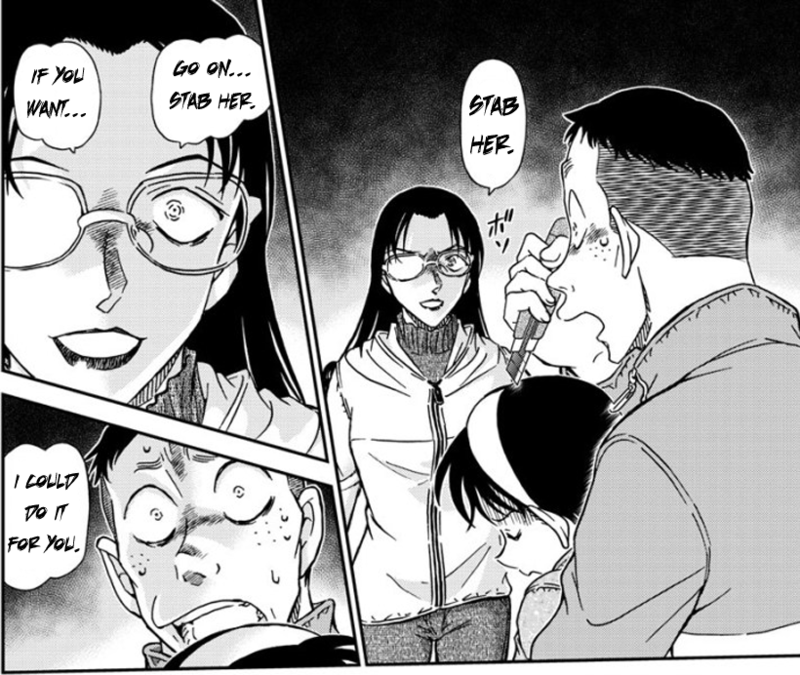 Alternatively, Asaka could've been talking with Kōji, thus giving Rum the chance to go and kill Amanda unimpeded. Which then would've led to a fight between Rum and Asaka & Kōji. After knocking Asaka out, Rum immediately hurried to silence Kōji, since if he killed Kōji quick, he could prevent him from escaping, and then come back to silence the unconscious Asaka—silencing Asaka before Kōji ran the risk of letting Kōji escape. After that, Tsutomu intervention, Rum flees, and then Asaka flees. 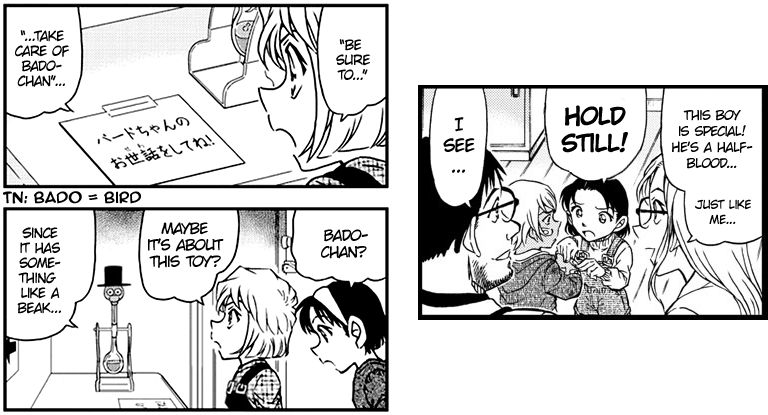 Considering that room service was ordered during Amanda's previous meeting, hinting to Sato's trivia about Shogi players eating sweets during a game (File 946), Rum could've also started a game of chess with Amanda in order to get her snack and drink tea during the game (so he can poison it). If Asaka wasn't APTX'd, then Rum must've been distracted—likely by Kōji (Asaka Vs Rum might've been underway in the hallway by the time Kōji came into view, or he came into view of the room just in time to see the fight spill out into the hallway). A fight would, in theory, have to cause cause a mess in Amanda's room. Considering that Asaka is a bodyguard figure, it wouldn't be an mess-free takedown. If he was distracted, then he wouldn't have time to clean things up. Wouldn't you agree that the information about a tidy/unmoved room is suggesting that Rum had enough time without distraction to clean up any Asaka-fight-aftermath mess? I presume that and Tsutomu's interference bought time for Asaka to regain consciousness—Asaka probably regained consciousness to find Kōji dead. Presuming they'd be arrested, they fled the scene. 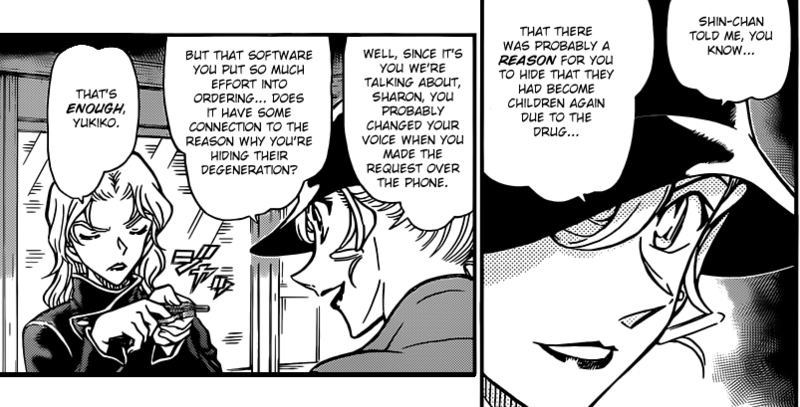 Ok, this one explains Amanda's clean room, but if Kohji was immediately handled after Asaka was taken down, how did Kohji have time to prepare the dying message? 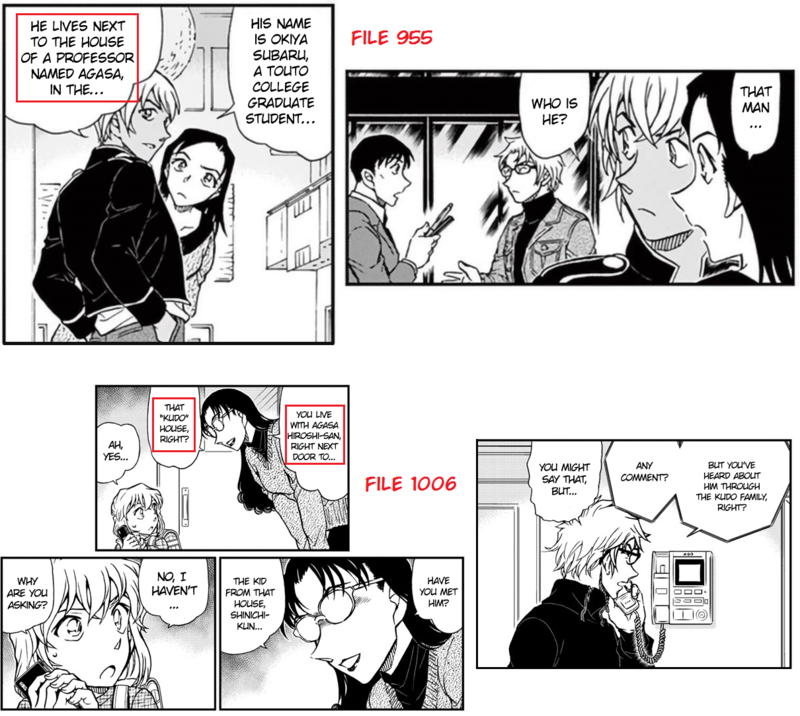 If he was wounded(defensive wounds) and poisoned before Tsutomu interruption, would he be able to move to the bathroom, crack/remove the hand-mirror from its frame, accurately cut out the letters and reassemble the remaining shards into the hand-mirror frame, leave the bathroom and place the mirror under the broken crockery pieces before finally not being able to take the pain of the poison and die? 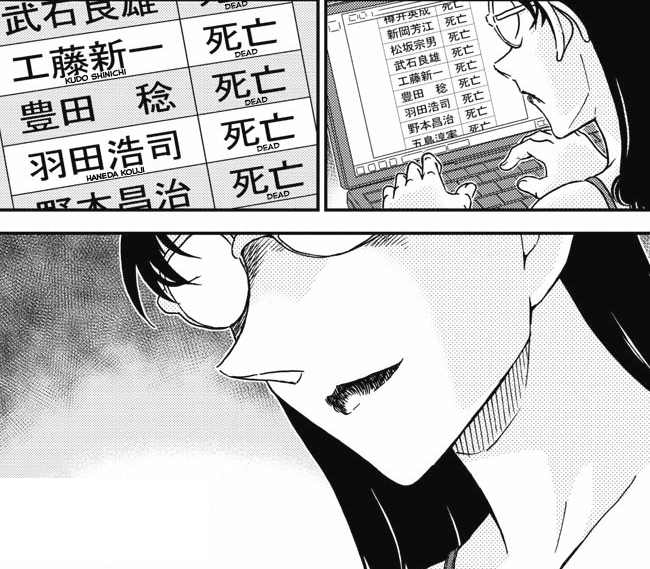 For that scenario, it would need a very specific time window in order to keep her room from having to be cleaned up by Rum—perhaps after poisoning Amanda, Rum went to silence Asaka (perhaps Rum called Asaka in when Asaka was standing outside). At this point, Kōji just happens to come by—he notices either Rum and Asaka going in the room or notices that no one is outside the room. 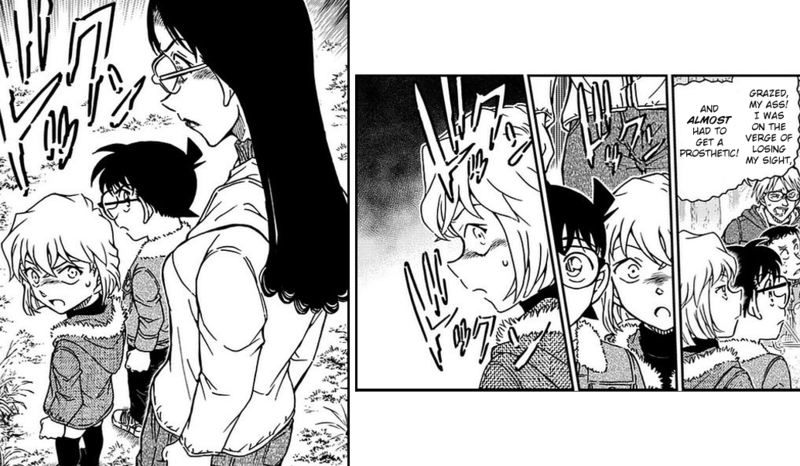 He elects to then enter the room—and finds Asaka under attack (and likely sees Amanda dead, as well). A surprise attack by Rum near the door, inside the room, would allow there to be physical contact without messing up the room—at the very least, it would keep any potential mess to a minimum. Rum immediately stops and lunges at this witness to his crimes. Kōji runs, but Rum is able to stay right on his heels—this leads Kōji to conclude that he won't outrun Rum, so he makes for his own room, and tries to keep Rum out. At this point, Asaka is either in a haze from Rum's surprise attack, or is unconscious due to it. In the former case, Asaka comes at Rum, only for Rum to take advantage of Asaka's haze and incapacitate them—before he can APTX Asaka, however, he sees Tsutomu running at him. He quickly realizes he has to silence Kōji—now. He breaks in, finally. Kōji sustains defensive wounds before Rum forces APTX down his throat. Tsutomu then barges in and fights Rum. The fight ends with Rum fleeing the scene. In the latter case, Rum sees Tsutomu running at him as he tries to get Kōji's door open. He quickly realizes he has to silence Kōji—now. He breaks in, finally. Kōji sustains defensive wounds before Rum forces APTX down his throat. Tsutomu then barges in and fights Rum. The fight ends in Rum fleeing the scene. Perhaps Tsutomu leaves Asaka in the lurch, but perhaps he doesn't—the former scenario fits better with Asaka being rendered unconscious by Rum's initial surprise attack, while the latter scenario fits better with Asaka managing to stay conscious longer after Rum's initial surprise attack. As for the Asaka talking with Kōji scenario, this would lead to Asaka putting up a better fight—nonetheless, Kōji would still be forced into his room. When Asaka is finally rendered unconscious, Rum sees Tsutomu running at him. He quickly realizes he has to silence Kōji—now. He breaks in, finally. Kōji sustains defensive wounds before Rum forces APTX down his throat. Tsutomu then barges in and fights Rum. The fight ends in Rum fleeing the scene. In this case, Tsutomu intervening on Asaka's behalf and getting them out of there while they're unconscious fits this scenario better than Tsutomu leaving Asaka in the lurch. 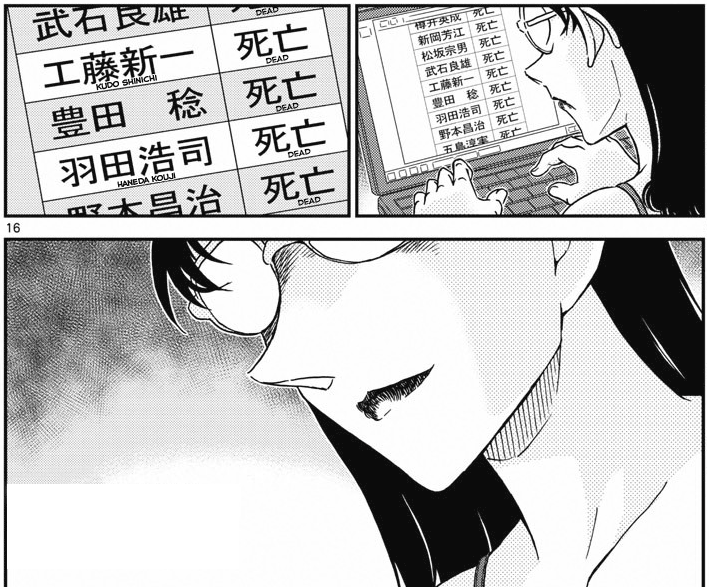 As for the Ryuma shogi piece, I believe Rum would've destroyed it had he actually gotten his hands on it—its continued existence would place him at risk. 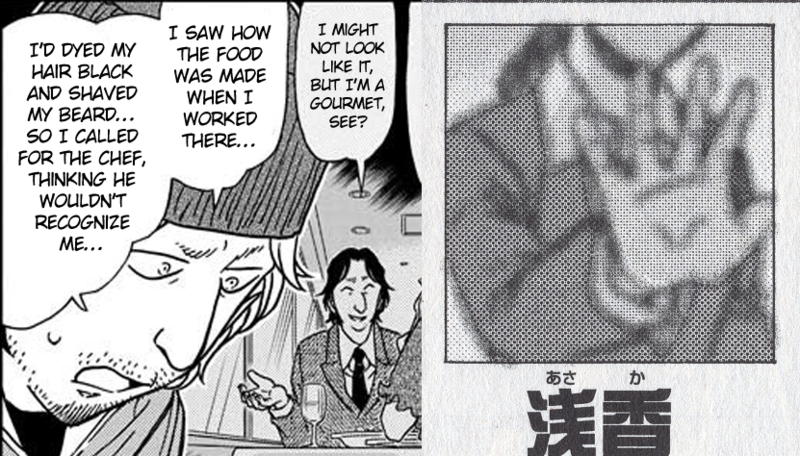 Keeping it around for 17 years seems foolish of him—keeping it around for 17 years and then giving it to Vermouth seems even more foolish of him. 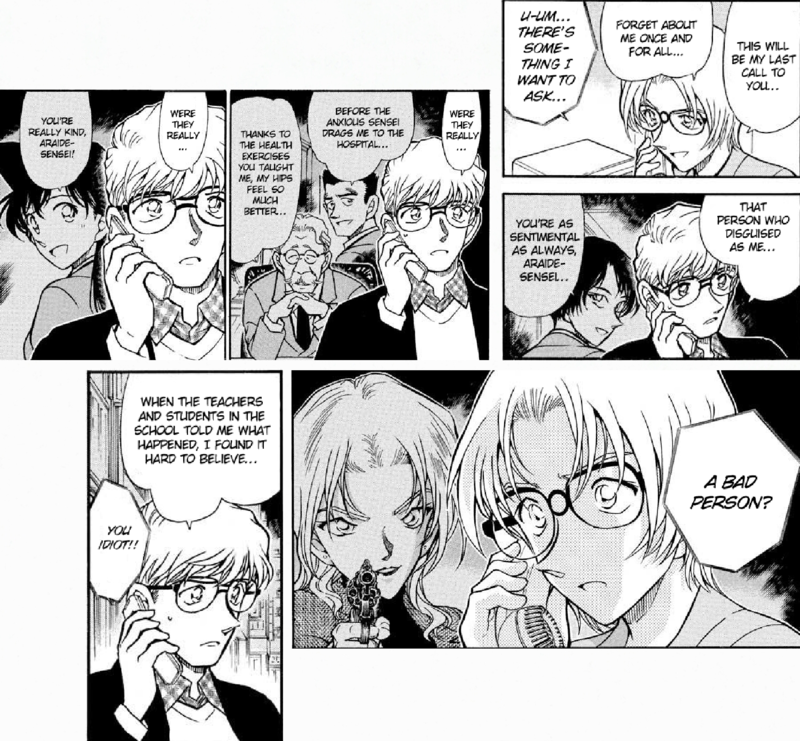 If Gin doesn't trust Vermouth's antics, why would Rum, a man Gin seems to respect the authority of, and a man who has gotten Vermouth to back off (yes, Movie 20 isn't canon, but didn't Gosho write that scene—correct me if I'm wrong)? Even if Anokata told Rum she should be allowed to have it, if she was insistent on having it for her plans, her getting her hands on it at all would require Rum to keep it for 17 years—which is very unlikely to me. So if Rum didn't take it, either Asaka or Tsutomu took it. If Asaka were to take it on their own, after regaining consciousness, that decision would be based on impulse rather than cohesive thought. If Tsutomu took it, perhaps he left it with Asaka. Since Rumi has the piece, this line of reasoning lends to the idea that Rumi is Asaka. I see, so in the latter scenario, Kohji locks Rum out as well, and Kohji and Asaka are not having their chat inside his room. Oh no, it doesn't even have to be the exact same piece. 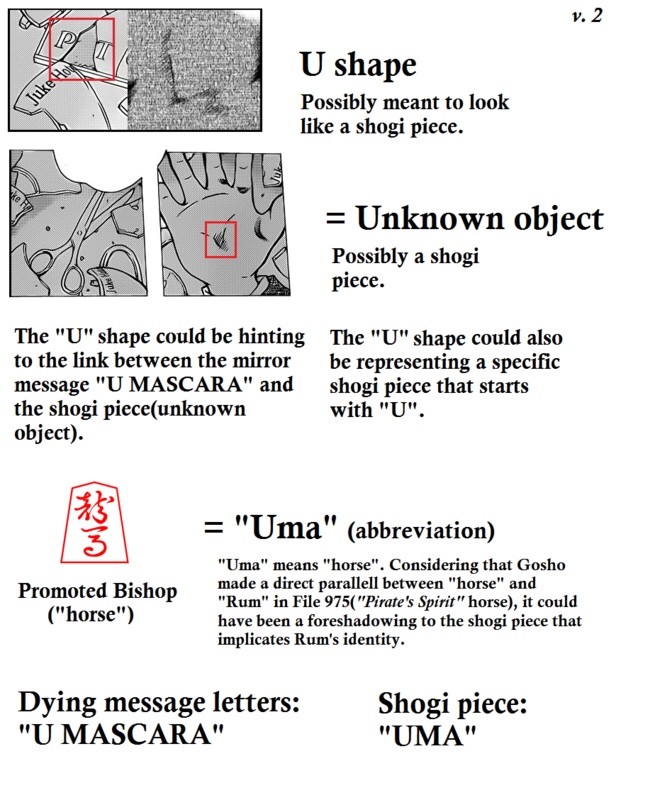 for starters, such a piece wouldn't even be able to endanger him, since it's just a shogi piece that you can wipe fingerprints away from. nothing about such a piece could be narrowed down to originating from the Kohji case, unless there's distinguishable marks on it that a photo or a non-biased witness could corroborate was made by/belonged to Kohji. And like I said, it doesn't have to be the same piece. 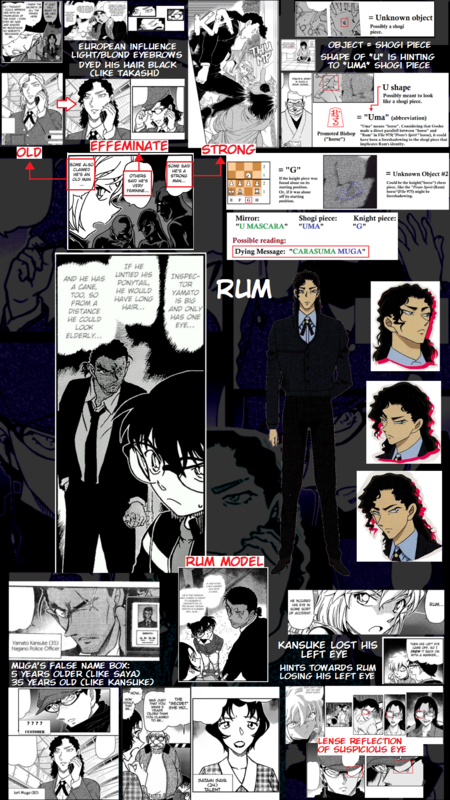 It's enough for Vermouth to get ahold of the info that such piece existed, whether Rum got rid of the piece or not. And I assume there's no suggestions yet for how that shogi piece, which Kohji must have clenched in the middle of his right palm, plays into the dying message or identitfies Rum? More of a just-to-be-safe measure than anything else. Via deduction? With or without testimony from Rum (again, I'd doubt he'd just tell her about that)? 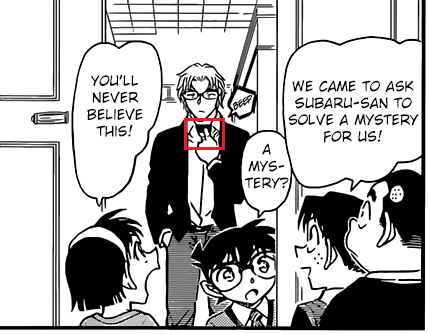 I'd think the only one who'd know about the piece and its significance would be the one who took it from Kōji's dead hand—even if the case info specifies that a Ryuma piece that was there before was missing (assuming they took note of such a fact, of course), the only one who could be certain that it was part of Kōji's message is the one who pried it out of his hand. Honestly? No. I just don't feel comfortable, at this stage, making predictions about this dying message—and that's even if we do, right now, have all the pieces. "Ryuma Carasuma." That's what we seem to have—I don't know how that points to Kanenori Wakita. that, or just anyone else that got ahold of Rum's testimony, like the boss (who views Vermouth as his favorite due to some relationship). the one who pried it out of his hand could be Rum himself. that's the issue with "Wakita Kanenori". His name itself is an obvious alias derived from "Toki wa kanenari" (more than likely at least). 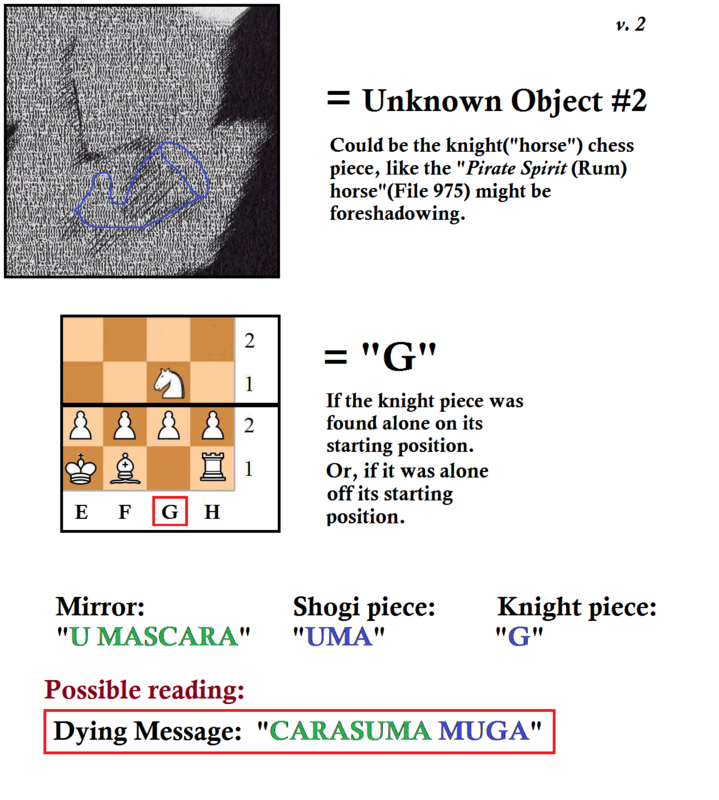 In other words, without an actual real first name that doesn't seem like an alias, there's no method to idenitfying him as Rum through the dying message (assuming he is even Rum to begin with), and I don't see us getting a new name from him that the shogi piece + whatever remaining clues can allude to. 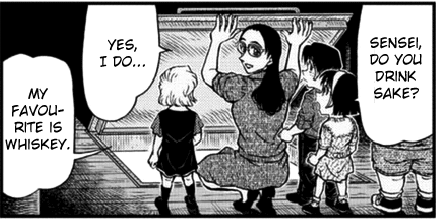 I honestly think either Asaka or Tsutomu would have had more windows of opportunity to take it. I guess it depends on whether you think the piece Rumi has is the very same one pried out of Kōji's hand or not—if it is, she's more likely to be Asaka. 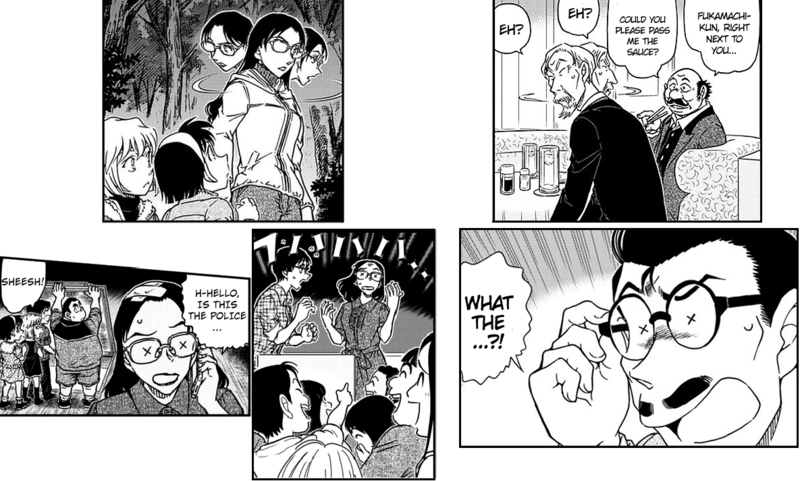 I have to wonder what prompted him to choose that specific alias—whether he's Rum or not, for him to happen to have an alias that, re-arranged and translated into English, is Rum's catchphrase (at least, it's his catchphrase in the context of these "Hurry up and give me intel on Shinichi Kudō" messages he's sent to Bourbon)... is it just an out-of-universe signal to readers from Gosho, or does the man with this alias have a reason for choosing it? All I can say is... there's no requirement for Rumi's piece(s) to be the exact same object(s) taken from that case because they are generic objects that aren't unique to that incident. You can find an uma piece anywhere. We can at least infer however that such knowledge was acquired by her (whether it was by directly being in possession of said objects or whether she got the info/objects second-hand). I'm pretty confident about this being an in-universe word play, much like "Mizunashi Rena"="no water (0) re (0) na (7)". My interpretation on that is straightforward. Wakita uses the idiom "Toki wa Kane nari" frequently (which without any translations was made directly into a name by rearranging letters). He is after all portrayed to be an edokko who uses japanese proverbs. Now, as for the later bit about Rum using an english version of that quote, that's a matter of what ones preconception of Rum is, if he is someone more accustomed to the english language, or if he is an edokko who for some reason decided to use it in a more out-of-character way. 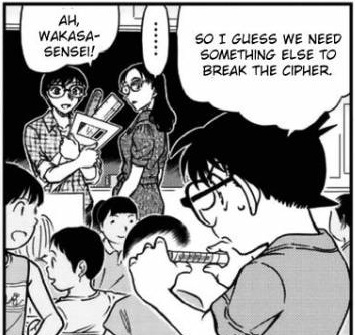 In the former angle, then it's possible that there's some kind of influence between Rum and Wakita that lead to both of them using the same idiom (but in their own way). In the latter angle, then that would mean that Wakita, as Rum, simply chose it because that was the name that came natural to him, because he uses its origin often, even in a different language. 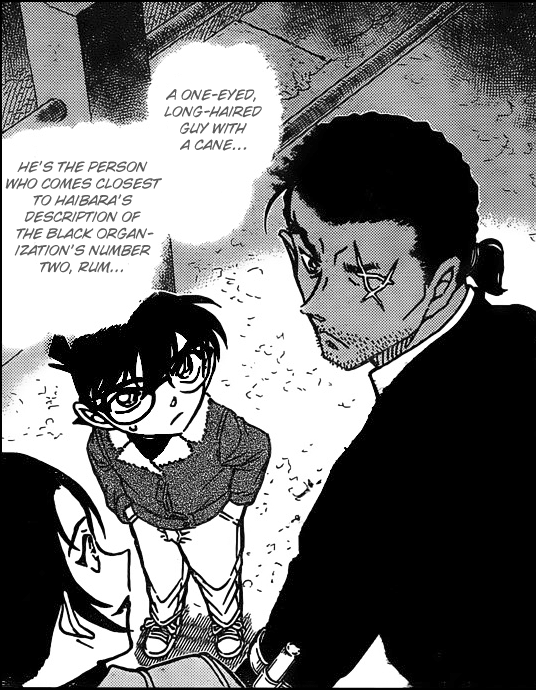 In the same way, if he is indeed working on Gin's behalf when it comes to Kogoro, and if he is indeed behind Mary's shrinking (as alluded to by his fitting covered left eye to Akai's left eye, which was hit by a Mary-knife-hand-strike), He is more than likely the source of the idiom "It's like encountering a demon in the darkness" as well, which could mean that he is indeed the idiom bank who (in the former angle) influences his fellow members (maybe as a high-up senior/mentor/coach figure) or (in the latter angle) simply rubbed off on Gin as second-in-command (with the latest SDB allusion of antipathy between Gin and Rum, this latter angle seems unlikely). I wonder where the name Asaka came from? Was the dying message of the Koji Haneda case meant to hint Karasuma or RUM/Asaka ? Or both ? this part of the story seems really strange to me. Whoever the characters are, why do we have those 3 names in that dying message and what’s with that name Asaka ?